In addition to doing some last minute artwork for Save The Date and teaching at SAIC, I've mostly been working on A Matter Of Life, the next autobiographical book which has stories mostly about fatherhood and religion. Here's part of a cover design sketch on the top left. 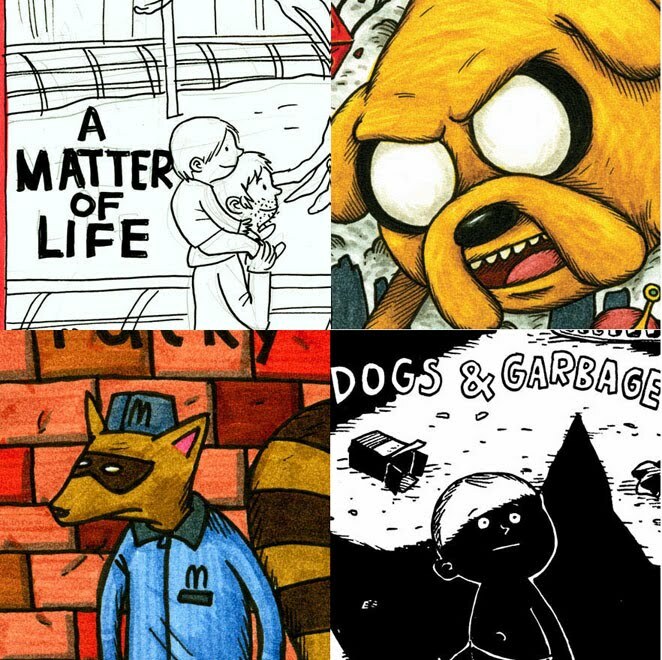 On the top right is part of my drawing for the retailer incentive cover for the first issue of Adventure Time comic book (in this month's Diamond catalogue, so order at your comic shop now). 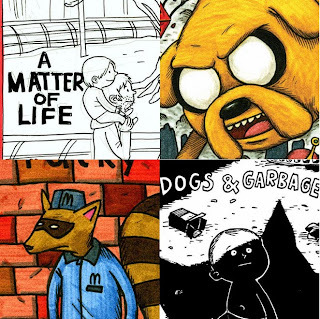 The bottom left is a drawing of Racky, based on one of John Porcellino's King Cat covers, drawn as a thanks to John for speaking to my class at SAIC. The bottom right is part of the cover to a minicomic I created in conjunction with the New Trier Literary Festival. I gave a talk to students, then had them write a comic with me - I sat and drew thumbnail pencils while they gave suggestions for what the comic should be about and what should happen next. I inked the comic at home later on and failing to think of a good title, settled on naming it after an Anders Nilsen book.